The following blog is by Carl Richards originally published in The New York Times’ Blog. The day after Christmas, a skier was caught in an avalanche near my home in Park City, Utah. Part of a foursome, the skier slid with the snow for about 500 feet before ending up buried to his neck. Luckily, his party found him, dug him out, and discovered he hadn’t been injured. The group knew the area well. Based on the conditions and their experience, they had planned to avoid the steeper, more dangerous section of the slope. Then, things changed. After skiing another section of the slope four times, they slowly moved into more dangerous terrain. Skiing so close to potential danger without any issues gave them a false sense of security. I’ve been in this position before, too. You tell yourself a story. Everything has been fine so far. Things must be safe. These long periods of safety sow the seeds of future failure as risk creeps in incrementally. It’s so subtle we rarely notice it. It’s fascinating how often we look back on mistakes and see all the obvious warning signs. They’re so obvious we openly admit how dumb we were to miss them. The cause seems to be associated with something I’ll call risk creep. We start with a plan that offers a clear margin of safety. Then, slowly, we allow ourselves to take just a bit more risk. Of course, we don’t call it that. Most of the time we don’t even recognize we’re doing it. As things go well, our perception of risk goes down. We start to feel safe and as a result we take one small step into territory that we previously labeled out of bounds. The process repeats. Take a small risk. Things go well. Increase risk. Repeat until failure. A new year is a great time to examine our financial lives for signs of risk creep. Start with expenses. The normal response to getting a raise, for example, is to let expenses grow to meet the new income. If we’re not careful, this trend continues year after year until one day we wake up and realize we’re spending two or three times more than we did a few years ago. Next, pull out your investment statements. As the stock market does well, we start to believe that it will always do well. We start shifting more of our 401(k) money into stocks and say to ourselves, “Risk? What risk?” It’s really just like a C.D. earning 10 percent, right? It happens so slowly for many of us that we don’t realize we’ve allocated more to stocks than we promised ourselves we ever would coming out of the terror of 2008 and early 2009. Now it’s time to look at our debt. As the economy rolls along, we start to feel more comfortable with debt. We tell ourselves that we can always pay it off — eventually. It’s particularly dangerous with mortgage debt. Real estate values do not always go up, in case we’ve already forgotten. The remedy for risk creep happens to be what some would argue is the most important word in the English language: remember. Just remember what it was like to watch a retirement account go down by 50 percent (or more) in 2008. Or what it was like to miss a mortgage payment. Then we need to take a close look at where we are in terms of risk creep and remember: things change. About the author: For the last 15 years, Carl Richards has been writing and drawing about the relationship between emotion and money to help make investing easier for the average investor. His first book, “Behavior Gap: Simple Ways to Stop Doing Dumb Things With Money,” was published by Penguin/Portfolio in January 2012. Carl is the director of investor education at BAM Advisor Services. 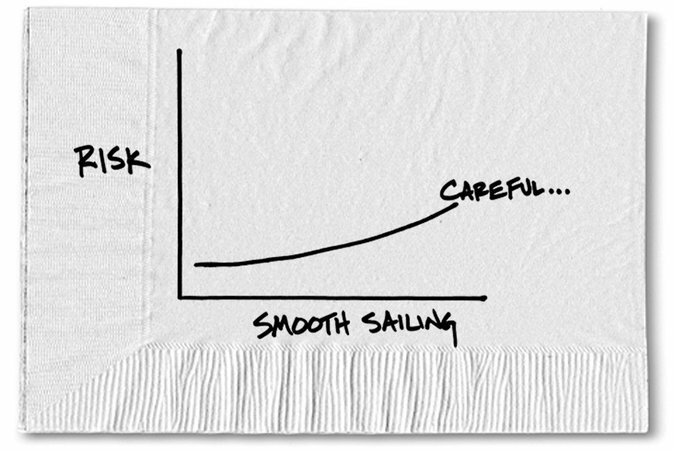 His sketches can be found at behaviorgap.com, and he also contributes to the New York Times Bucks Blog and Morningstar Advisor. You can now buy – “The Behavior Gap” by Carl Richard’s at AMAZON. 0 responses on "Featured Blog: In Assessing Goals, Be Wary of ‘Risk Creep’"
Woman spreading – Are you doing it right? What Women Want – Can you have it all?